Welcome to a coleslaw recipe that is not slathered with mayonnaise but has a smooth, creamy feta dressing. Although I do love a mayonnaise drenched coleslaw I am finding that sometimes I need a break from it. Coleslaw is one of my snack foods and sometimes I will eat simply a bowl of coleslaw when I don’t feel like cooking but am hungry. With a sprinkled of grated cheese for a treat too. To me, coleslaw is the equivalent of a bowl of cereal for those who would eat a bowl of cereal for every meal. Seinfeld re-runs are currently on our television network in the morning so I am thinking of him especially for this! All those student days when you lived off either toast or cereal too. 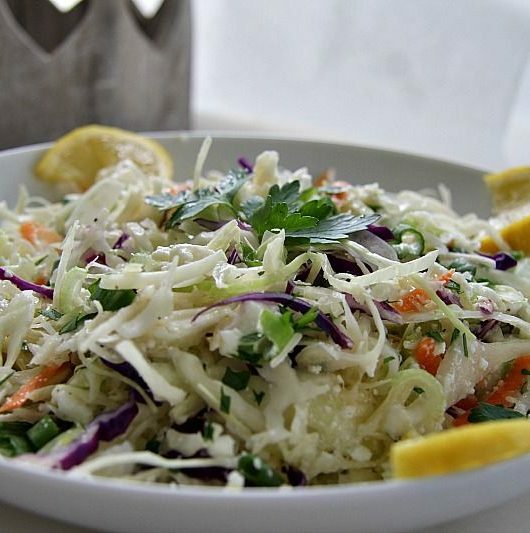 For me, coleslaw is the easiest way to ensure that I am eating raw vegetables which is always good for you and your digestive system. 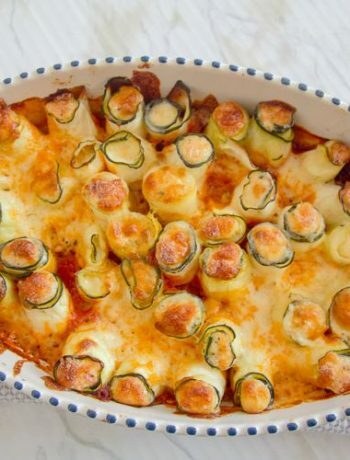 You need to ensure that you are not always eating cooked to an inch of its life vegetables. 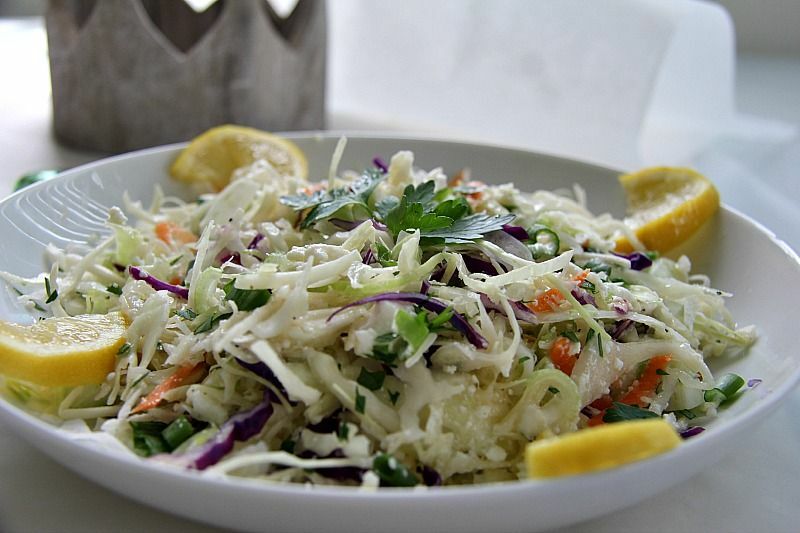 Salad and coleslaw are the easiest way to do this. Sprinkling rocket on your pizza counts too, doesn’t it? Hee hee! I find with coleslaw recipes that they benefit from sitting in the fridge for at least an hour for the flavours to develop and this recipe is no exception. The lemon and feta seem to collaborate behind closed doors and give the dish an extra depth when left on its own devices. Coleslaw dressing does not have to mean half a jar of mayonnaise either. I love my avocado coleslaw as another alternative too! I sneaked this onto the Chief Taster’s plate as part of a main dish one night without telling him. If I had announced that there was no mayonnaise in the coleslaw he would have judged it without sampling it and started a protest in the kitchen. Handmade banners, rude chants and everything but the police guarding him at a safe distance from me. Afterwards, I questioned him about the feta coleslaw and he confessed without wife intervention, that he enjoyed it. It may have been the distraction of a meat dish on the plate but there were no complaints to the kitchen about the coleslaw. He was a bit surprised that it was not as dry as he would have imagined if pre-warned about no mayonnaise (and why I never told him in advance). 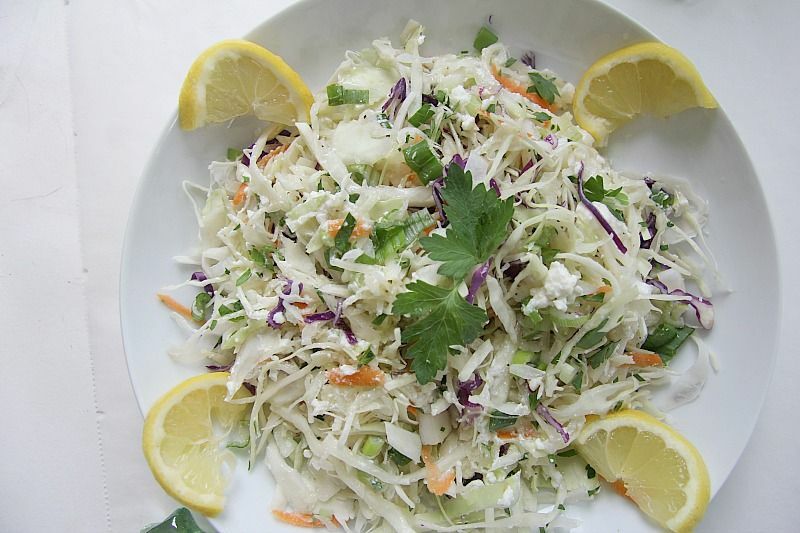 It is just the blend of feta, olive oil and lemon that works as the coleslaw dressing. I will confess that for the photos that I purchase ready chopped coleslaw from our supermarkets. As well as being lovely and fresh, it’s wonderfully cheap and better value for me than purchasing a white cabbage. It has the faintest scattering of red cabbage and carrot that could not be picked out in a taste test, but gives the plate a hint of colour. 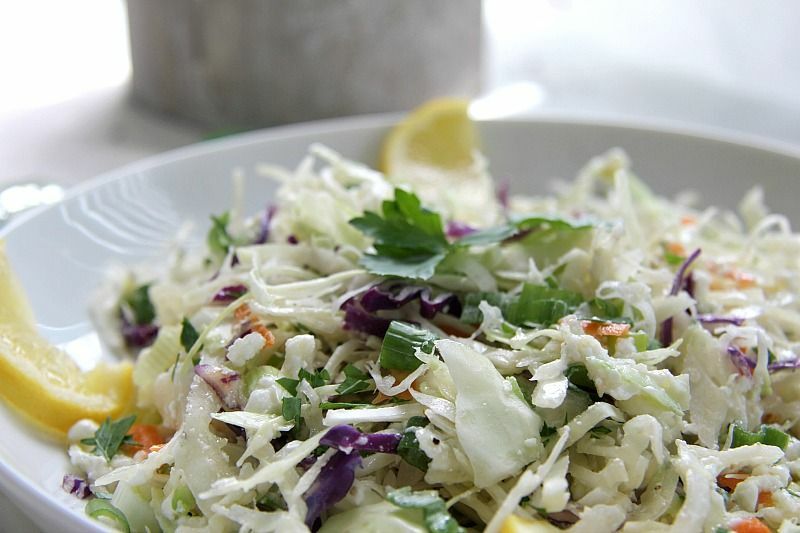 As with coleslaw, add your own preference of ingredients in addition to white cabbage. Sometimes I like to finely chop up a red pepper in it if I’m having a playful mood. 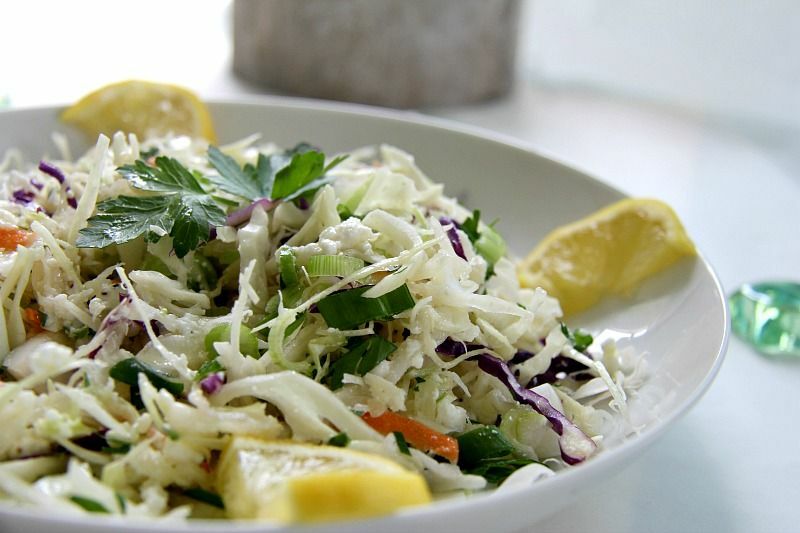 Open your minds and hearts to a coleslaw without mayonnaise and give this recipe a whirl. Perhaps add some fresh herbs to give it an extra layer of taste too. I think basil or fresh oregano would almost give it a Mediterranean feel to it! Place the white cabbage and green onion in a bowl. Blend the Feta cheese, lemon and olive oil in a bowl. Add the salt and pepper. Pour over the cabbage and toss until covered. Wow, very delicious. Whole family enjoyed it!